Download the PDF of the English version here: Cerrado Deforestation Disrupts Water Systems and Poses Business Risks for Soy Producers. Download the PDF of the Portuguese version here: Cerrado Deforestation Disrupts Water Systems and Poses Business Risks for Soy Producers. Native Cerrado vegetation is crucial for Brazil’s water systems as it supports rainfall through evapotranspiration. The deep root system of native Cerrado vegetation maintains the water balance in the region and throughout Brazil. It feeds 8 out of the 12 different hydrological regions in the country. Agricultural expansion in the Cerrado has replaced native vegetation. Soy acreage in the Cerrado increased by 9.54 million hectares to nearly 10 percent of the total Cerrado region, resulting in 2.83 million hectares of deforestation between 2000 and 2017. Sixty-nine percent of all soy-driven deforestation occurred in Matopiba, which is often referred to as the “last soy frontier” in Brazil. Matopiba saw a total of 1.9 million hectares of deforestation during this period. Deforestation contributes to increased droughts and erratic river behavior. Deforestation facilitated an 8.4 percent drop in annual rainfall in the Cerrado over the last 30 years and more variable rainfall patterns, posing the possibility of productivity loss for crops planted. Limited rainfall and high evaporation may lead to sharp decreases in productivity. Most of the soy farms in Matopiba are rainfed. As a result, producers are exposed to adverse impacts of agricultural droughts. In both 2012/2013 and 2015/2016, these factors negatively affected soy production in Matopiba. During those years, soy yields were as much as 40 percent lower than they were in Brazil as a whole. Therefore, the meteorological impact of agricultural expansion may create operational risks for soy producers. Soy companies may become exposed to conflict over water with other users such as local communities. Pressure on water resources in the Cerrado region has increased tensions between farmers and local population. Factors that contribute to heightened conflict risks include water used for irrigation, reduced spring water levels and agrochemical pollution. Soy producers and farmland investors may face increasing risks from declining agricultural suitability of farmland in Matopiba. Climate variability negatively influences soy yields and profits and further lowers the projected productivity of land. This may decrease the value of farmland, and lead to the risk of stranded assets. The Cerrado is the second largest biome in Brazil, covering more than 20 percent of Brazil’s terrain. It consists of wooded savannah with long root structures. The Cerrado native vegetation and root structure play a key function in Brazil’s water systems. Native Cerrado vegetation is crucial for water cycles. Evapotranspiration in the Cerrado and Amazon influences rainfall in the midwestern and southeastern parts of the country. Reduced evapotranspiration in the Cerrado can lead to reduced rainfall patterns in the neighboring Amazon region as it depends on the evapotranspiration rates in the Cerrado. Evapotranspiration in the Cerrado affects rainfall in the Cerrado itself as well.The deep root system of native Cerrado vegetation maintains the water balance in the region. The Cerrado is also known as the inverted forest, due to its exceptional long roots. This deep root system of Cerrado vegetation retains water and is capable of supporting evapotranspiration and generation of rainfall in dry years in the region. The importance of the Cerrado for water availability throughout Brazil is reflected in the fact that it feeds 8 out of the 12 different hydrological regions in the country. 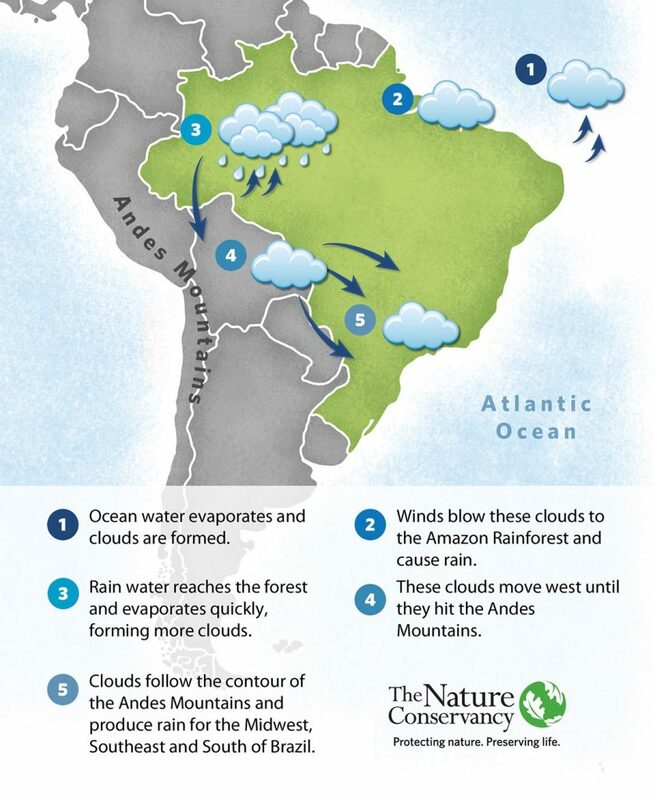 Figure 1: Illustration of different steps in the water cycle of Brazil: evapotranspiration in the Cerrado (2) influences rainfall in the Amazon (3). 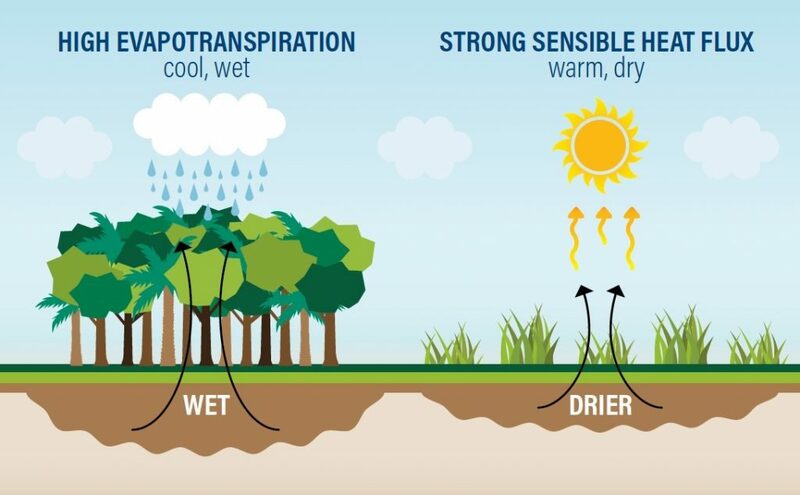 Note: Evapotranspiration brings water from vegetated and non-vegetated areas into the atmosphere by transpiration (through plants) and evaporation (through soil). Through transpiration, trees ensure water enters the atmosphere and in turn produces clouds and rain. Soy cultivation has expanded extensively during the last two decades in the Cerrado biome. 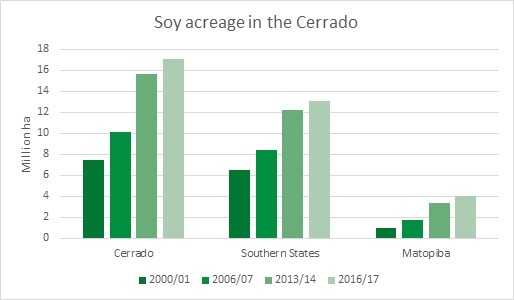 According to a recent study by AgroSatélite, soy acreage in the Cerrado increased by 128 percent between 2000/01 and 2016/17 (2000/01: 7.5 million ha. 2016/17: 17.1 million ha). Much of the soy expansion took place in Matopiba, which is often referred to as the “last soy frontier” in Brazil. Here, soy acreage expanded by 300 percent (2000/01: 1.0 million ha; 2016/17: 4.0 million ha) over the same period. The Cerrado biome now accounts for 50.4 percent of Brazil’s soy acreage. The expansion of soy has come at the expense of the native vegetation in the Cerrado. Of the 9.54 million ha total expansion between 2000/01 and 2016/17, 30 percent (2.83 million ha) occurred in deforested areas. This percentage is significantly higher in Matopiba, where 65 percent of soy expansion (1.9 million ha) replaced native vegetation. Average deforestation rates reached their highest levels at the beginning of the century, but they dropped significantly in recent years. However, in 2017, deforestation rates rose by 9 percent compared to 2016, which could indicate a new trend. Clearing vegetation for agricultural expansion has affected rainfall for the whole country. Removing the root system of the native Cerrado vegetation has negatively affected water retention, evapotranspiration and the generation of rainfall in dry years in the Cerrado region. Removing vegetation has increased the water system responses after a rainfall event, leading to floods and droughts. The deforestation-related impact on water for soy cultivation is combined with effects of climate change in the Cerrado. Among these effects are dryer conditions, especially during the planting of soybeans, which are planted early to enable two harvests in one season. Climate modelling shows that deforestation in the Cerrado increases the climatic variability. Simulated mean annual evapotranspiration is 39 percent lower in agricultural ecosystems (pasture and soybean cropland) than in natural ecosystems (tropical rainforest and Cerrado). After the deforestation of Cerrado vegetation, the hydrological behavior of the region changes. That occurs because water does not fully return into the water cycle through evapotranspiration. Limiting evapotranspiration can lead to increased precipitation variability. Research from Brown University shows that for every million ha of Cerrado converted to croplands, dry season evapotranspiration decreases by 1.7 km3. In 2013, cropland areas recycled 3 percent less water than what would have occurred had the land cover been native Cerrado vegetation. During the rainy season, from October to April, when soy crops are grown, evapotranspiration in agricultural areas is similar to that in areas covered by native vegetation. However, in the dry season, the volume of evapotranspiration in agricultural areas averages 60 percent lower than in areas with native vegetation. In the Amazon region, between 24 percent and 56 percent of evapotranspiration is recycled into precipitation. Therefore, limited evapotranspiration could result in an annual rainfall reduction on the order of 8-16 mm (-3 percent) in Matopiba region. A University of Brasilia study linked deforestation to an 8.4 percent drop in yearly rainfall in the Cerrado over the last three decades. The conversion of Cerrado into open grasslands (or planted crops) has reduced precipitation by approximately 10 percent. The effects have also caused an increase in the frequency of dry periods within the wet season and a rise in mean surface air temperature by 0.5°C. As noted, deforestation risks changing the onset of the wet season or altering the duration of the dry season. 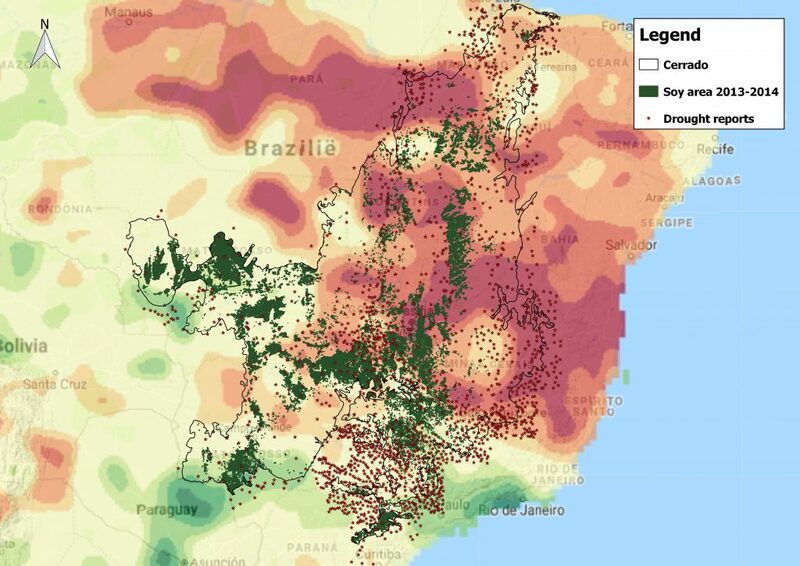 A deforestation scenario for the Southern and Eastern Amazonia region, shows that deforestation in the Amazon and Cerrado combined will reduce rainfall and prolong the dry season from five to six months, affecting agricultural production. Converting native vegetation to agricultural land substantially modifies the amount of water in both small and large Cerrado rivers. The rates of surface runoff and evapotranspiration affect the seasonality of water flow in rivers and groundwater. When the native vegetation is removed, runoff accelerates rather than water infiltrating and feeding springs or aquifers or being absorbed by roots. Other important consequences of clearing Cerrado vegetation include an increased chance of flooding, eroded fields and valleys, and excessive sedimentation during the rainy season (October-April). Infiltration rates are considerably lower at pasture and cropland sites compared to native vegetation. The Nature Conservancy (TNC) analysed rainfall trends in the region over the last 30 years and found increasingly frequent and varied extreme rain events, along with an overall decrease in river flows. At the same time, the Araguaia River, one of the major river basins in Matopiba, saw a 25 percent discharge increase. Two-thirds of the increase is the result of deforestation, whereas climate variability can explain the remaining one-third. TNC also illustrated consequences of land conversion and availability of ground water resources in West Bahia. Conversion of land that is important for ground water infiltration could result in a reduction of groundwater availability in the main Urucuia aquifer. The deforestation-linked water impacts may lead to sharp decreases in productivity due to reduced precipitation patterns. As such, the meteorological impact of agricultural expansion could create operational risks for soy producers, including the listed companies SLC Agrícola and BrasilAgro. In Matopiba, local governments have supported the expansion of mechanized agriculture. The local governments, however, have not adopted climatic variability adaptation measures. Without adequately addressing these water and deforestation risks, investments in Matopiba can become a high-risk strategy. Soy production relies on the availability of sufficient water in the soil. Most of the soy farms in Matopiba are rainfed, with only a limited area under irrigation in Bahia (16 percent of the total productive agricultural area). Rainfed Matopiba soy production is exposed to the adverse impacts of agricultural droughts. The problems occur when the soil moisture drops to levels that adversely affect the crop yield and agricultural profitability. The use of groundwater (center-pivot) irrigation systems in Matopiba is increasing to compensate for the lack of rainfall. The March 2016 agricultural drought map illustrates how severe droughts in Matopiba largely overlapped with the soy planted areas. Source: Latin American Flood and Drought Monitor and Sistema Integrado de Informações sobre Desastres Source: Latin American Flood and Drought Monitor and Sistema Integrado de Informações sobre Desastres Note: The report shows significant drought issues in Matopiba that overlap with soy areas. The drought index reported here is a measure of severity of droughts for agricultural production, orange-red colors indicate drought conditions). The drought reports in the map show spatial distribution of droughts being reported by authorities throughout the region. 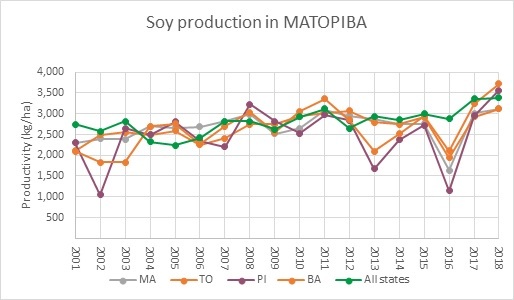 In both 2012/2013 and 2015/2016, limited rainfall and high evaporation negatively affected soy production in Matopiba, especially in Piauí. During those years, soy yields in Piauí (2012/13: 1,679 kg/ha; 2016/17: 1,143 kg/ha) were much lower compared to the productivity for Brazil as a whole (2012/13: 2,938 kg/ha; 2016/17: 3,364 kg/ha). In 2016, soy productivity in the Matopiba fell by 40 percent compared to other soy producing regions of Brazil as a result of dry weather. A study by Amazon Environmental Research Institute (IPAM) showed that in Matopiba, 55 percent of farmer respondents noted low productivity in the past eight harvests, while 52 percent of respondents pointed at climatic causes such as reduction in rainfall or rainfall starting late. In 2013, a drought particularly affected two of Brazil’s largest farm operators involved in soy production, BrasilAgro and SLC Agricola. With the majority of their farm portfolio situated in Matopiba (75 percent and 54 percent respectively) both companies relied on favorable climatic conditions in Matopiba. In 2013, BrasilAgro had to deal with severe droughts at its Northeast farms reducing 31 percent of soy yields. At the same time, SLC saw soy production fall by 15 percent. SLC reported the drought affected the Western Bahia and Piauí farms (see annex for overview of company policies). In 2017, after five years of drought, profits and returns for producers started to increase again. In 2017 and 2018, producers saw record yields, thanks to a combination of larger planting areas and positive growing conditions. According to the World Wildlife Fund (WWF), improved conditions for producers could accelerate the current trend of clearing of Cerrado forest in coming years. A recent study from the Stockholm Resilience Centre, shows that ongoing deforestation in areas such as the Amazon might soon lead to an ‘tipping point’, leading to large-scale changes in the earth system. The Centre projects that parts of the Amazon will become increasingly dryer, leading to major economic impacts on agricultural production. This point is expected if temperatures rise 3-4°C, or if deforestation reaches approximately 25 percent of total land in the Amazon. To date, almost 18 percent of the Amazonian basin has been deforested. Due to increases in temperature rise, deforestation and forest fires, it could arrive earlier than expected. The economic consequences of passing this tipping point may affect institutional investors in soy producers and farmland. Deforestation in the Cerrado impacts the climatic variability, and as a result threatens the sustainability of agricultural production in the region. 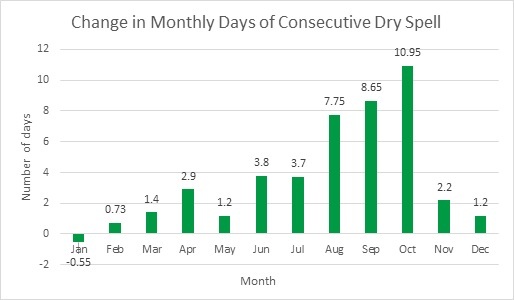 With deforestation projected to reduce rainfall, especially in September and October, the increases in variable rainfall patterns delay the onset of the soy planting season. This poses a risk of productivity loss for soy crops planted. 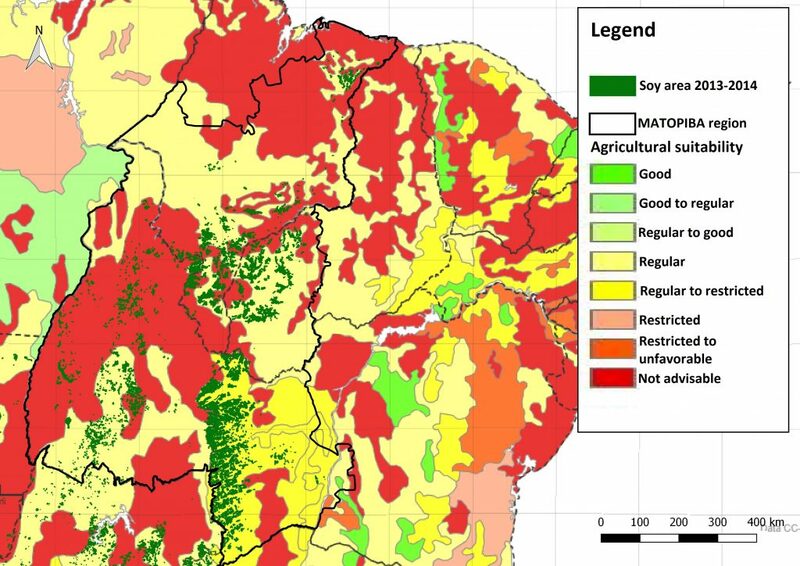 A recent Embrapa Brazil study shows that, under certain climate change scenarios, the area of land in Brazil suitable for soy production may decrease by up to 39 percent by 2040. The results point to an increase in heat waves and extreme weather in the coming years, while also increasing the possibility of water shortages. In addition to expected increases in temperatures, hydrological cycles are altered and some areas of cultivation — now considered low climate risk – may have higher risks from climate change. This outlook may hold back new investments in agricultural businesses in Brazil. According to the rules of agricultural credit in Brazil, in order to procure a loan for a given crop, the farmer must operate in an area where the risk of crop failure is less than 20% (a loss every five years). The World Bank expects that in the period 2020-2039 dry spells will increase up to 11 days in the September and November for Matopiba. Wide gaps between rainfall episodes could damage or destroy crops. Without adaptative measures, the current production of soybean and maize may not be sustainable in Matopiba. Even the more optimistic Intergovernmental Panel on Climate Change (IPCC) scenarios for the Cerrado depict that consequences of climate change could lead to economic losses of USD 1.7 billion for the main crops in the Cerrado (including soy), as well as crop migration southwards. The possibility of losing more crops creates additional production risks in a region in which agricultural suitability of land is already limited. 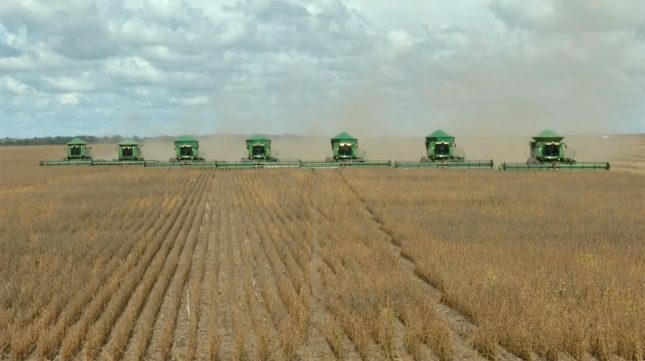 Researchers from Instituto de Manejo e Certificação Florestal e Agrícola (Imaflora) have indicated that due to the increased droughts and economic crisis, the expansion of soy production in Matopiba has stalled. The Institute for Society, Population and Nature (ISPN) in Brazil, meanwhile, has highlighted that most producers are too indebted to leave the area, and thus need to continue production even in the face of unsuitable conditions. Next to the risk of losing productivity and thus profits in the future, the negative climatic impacts also create a risk of stranded land. 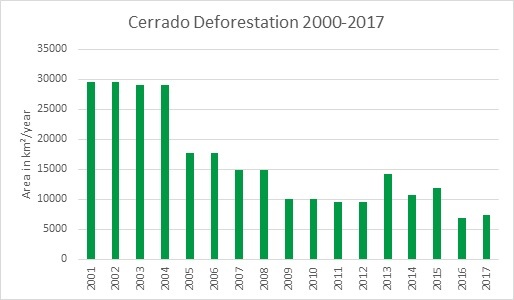 Continuation of deforestation of the Cerrado may lead to sharper decreases in agricultural productivity. Against this backdrop, even forested agricultural properties could be considered stranded. Stranded land is a form of stranded assets — land that cannot viably be developed. For companies such as BrasilAgro and SLC Agricola, both of which include the sale of rural farmland in the Matopiba as part of their business models, projections regarding unsustainability and decreased productivity in the region could affect the value of their land portfolios. Decreased value of their land would likely have negative impacts on the ability to sell their farmland in the future. Seventy percent of the Cerrado’s water supplies is now used for irrigation purposes for agribusiness. WWF water experts report that commercial pressure has increased for the use of irrigation, and banks in Brazil offer credit lines for irrigation purposes. Despite environmental and social sustainability concerns, current projects seek to expand the use of pivot irrigation systems up to 500,000 ha. Removal of roots and soils of the Cerrado forest, which act as a sponge for water, decreases water flows and can threaten supply of water by springs. Communities use those springs for multiple purposes (drinking water, cattle, and water for agricultural production). Pesticides in the Cerrado, which have potentially serious health implications, are consistently detected throughout the entire aquatic system. Social tensions and conflicts have in some instances led to protests and sabotage of farms. In 2017, 1,000 people occupied two farms in Bahia to protest their use of water from the rivers for irrigation, leading to the lack of water in neighbouring communities. In September 2017, a fact-finding mission in the south of Piauí, organized by a number of international human-rights organizations, revealed the effects of soy farm expansion on the availability and quality of water resources. Communities in Piauí indicate that water sources have diminished over recent years. Moreover, the remaining water turns bright red in certain seasons, which communities link to the use of agrochemicals by soy producers. Conflicts are already arising over deforestation and water pollution between small-scale farmers and soy producers in this area. SLC Agricola has identified climatic risks that pose a threat to the company’s production, revenues and results. It states that climate change is on the rise, and that the company does not see ways to prepare or protect itself from these climatic risks and lower rainfalls impacting its agricultural production. The company, however, is working to mitigate or spread risks by locating its farms across the Brazilian Cerrado, rather than concentrating them in just one region. An article from 2016 on droughts in the Matopiba noted that SLC Agricola decreased its planted area by 8,000 ha in response to climate risks. Agrifirma states that under its sustainability policies it adopts production methods that limits the use of water as much as possible. The company uses irrigation but asserts that it tries to do so in the most efficient way. Agrifirma has not published drought-related risk strategies, but states that Brazil has a favourable climate for production and an abundance of usable water sources that allows for agricultural output. In a Farm Futures article from 2016 on agribusiness responses to droughts in the Matopiba, Agrifirma was said to be leading the retreat from the reqion, as well as diversifying its crops to include more drought-resistant ones. BrasilAgro has published a report which highlights some potential risks that the company faces, including risks related to the environment and climate. The company mentions that it needs special authorization for its use of water, and acknowledges drought-related risks to its production. It states: “In recent years, several regions of Brazil have been affected by extreme climatic conditions, and the regions where our properties are located also experienced high temperatures, and a severe drought in recent years. The effect of severe weather conditions can reduce the productivity of our farms, damaging our revenue and cash flow and demanding high levels of significant increases in our operating costs, any of which could relevant and adverse impact on us.” BrasilAgro indicates that it retains rainwater on its farms through basins and contour lines, while avoiding erosion. Furthermore, it has adopted monitoring plans for quality and quantity of ground and surface water on its farms. The company has not mentioned other mitigation or adaptation measures. Insolo refers to the favourable topography and soils of Piauí, and adequate rains for its soy farms. Under its sustainability policy, the company states that it tries to prevent surface runoff, silt water sources, and monitor the water quality used in its structure. The company’s website does not elaborate on irrigation practices or drought-risk mitigation practices.